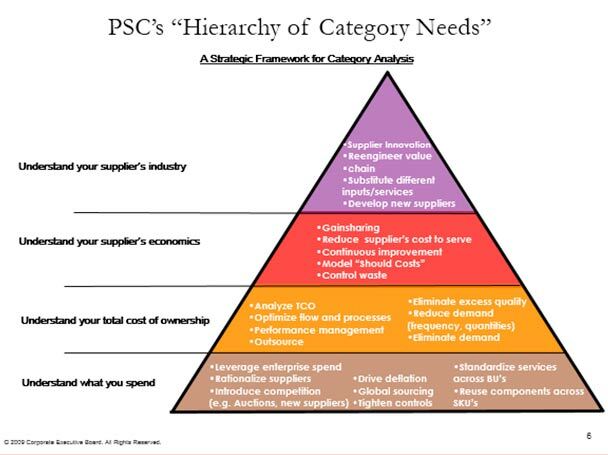 I was looking through some older presentations, thinking about a good topic for my next blog and came upon this Procurement Strategy Council (PSC) hierarchy for developing a category strategy. All too often, sourcing is approached in a simplistic fashion, and doesn’t look at the key elements to create the greatest value for the organization. While some of these tiers may at first appear self evident, let me share some thoughts on key activities you should pursue in developing your category strategies. There is no substitute for deep category knowledge, in creating impactful and appropriate category strategies. That usually comes from including knowledgeable internal clients on the sourcing team, including this expertise directly in your sourcing organization for your more significant categories and/or researching the category and understanding the related best practices. I have always thought that the most effective organizations had a good balance of pure procurement talent and subject matter experts, who can be trained in our methodology and negotiation skills. Rationalizing your supply base has many benefits that are often not easily quantified but significant, nonetheless. Think of all the costs with maintaining your supply base: all the interactions in negotiating and managing the contracts; the complexities of your supply chain, whether that be physical or administrative; the on-going interactions of your internal clients with your suppliers; and more importantly, the lost opportunities from not creating a big enough relationship where you have some leverage, create economies of scale for your supplier, and you becoming important enough for your supplier to share innovative ideas and give your company preference in supply and service. Leveraging your spend across the enterprise is clearly a major driver of value, and should be a starting point for any basic supply strategy. Unfortunately, many companies do not have the basic systems or capabilities to fully understand their spend, and as a consequence, lose major opportunities for value. And in many cases, the sourcing activities are done in more of a transactional mode, dealing with ad hoc spend, rather than standing back and looking at the entire category. By looking at the value drivers in a category and determining how to assess fair value, you can structure the appropriate contracts and take much work off your plate, allowing your teams to spend time sourcing other categories. There is no better way to assess market pricing than by conducting on-line auctions. Often, your internal clients will strongly resist putting their spend up for auction, thinking that they will lose control of the decision making process, disrupt their business or damage a relationship. 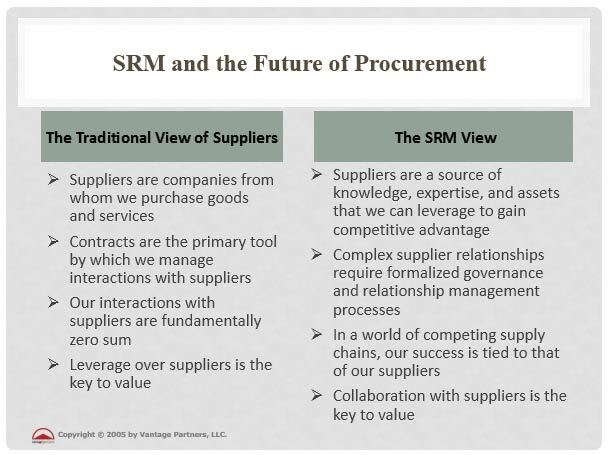 To counter this, make it clear that you will include in the auctions, only qualified suppliers (no shills just to lower price); that while price is important, it is only one of the criteria for supplier selection; and lastly, that the selection of the ultimate supplier rests with the client, obviously with input from the project team that includes client and sourcing representation and is guided by objective criteria for evaluating and selecting the supplier. My experience has been that by using auctions, an incremental 10-20% cost reduction is possible and it can reduce sourcing and negotiations time by as much as 50%. These savings in time are important in and of themself. That starts with understanding the needs of your internal clients and making sure that you have the appropriate specifications for the spend. All too often, your client will assume that they can get the very best of everything, not understanding the cost and supply implications of over specifying their needs. I have seen good programs of managing specifications and demand (usage) at companies where 20-30% of the cost could be taken out as a direct result of these efforts, without even addressing basic pricing. There are so many hidden costs to consider beyond simple unit costs. Clearly, you need to look at maintenance costs, obsolescence, usage rates, quality, etc. But also consider your company’s hidden costs in interacting with and dealing with the supplier. Is the supplier delivering the best quality and dealing with customer service issues in an efficient way that eliminates work for your company? Or is it a constant chore to get the supplier to perform in the way you expected when you signed their contract? And also consider upstream and downstream costs. Are there other subassemblies or related services that should be sourced with this spend, that create other efficiencies if bundled? I have seen much out-tasking vs. outsourcing that deals with individual components rather than the full spend, that miss significant sourcing savings for the company. Modeling “Should Costs” can often give you a very different reference point for what a product or service should cost, eliminating the grounding that often happens when simply looking at past costs. I can remember my group looking at cans for infant formula, using this approach. What started as shock and incredulity by our suppliers, quickly turned to acceptance of some starting points, upon which we put a fair profit margin. This was one of the largest sourcing gains for this division, paving the way for more closely partnering on other spend categories. You may find that the supplier you are using is charging you a fair price based on their cost, but they may not be competitive in the industry, a good sign that a supplier switch is necessary. Your best suppliers should be committed to continuous improvement and sharing some of these gains with you. Some benefits will result from better planning with your suppliers. Bigger gains are often the result of improvements in supplier operations, and the best are often using six sigma and lean programs to do that. I often used a continuous improvement clause in our contracts. Sometimes requiring as much as a 5-7% year on year improvement when processes or the relationship was new and sometimes making it aspirational, keeping this in front of the supplier and reminding them that this parameter was part of their balanced scorecard and had implications for them keeping our business. It is amazing how often our suppliers came up with great cost and quality improvement ideas, simply because we measured them on this. Gain sharing can be a powerful tool and incentive for your suppliers and can get them to perform well beyond contractual terms, which is where you want all of your suppliers. Some of the difficulty here is separating the things that your suppliers should be doing from those types of things requiring investment and expertise on the part of your suppliers. These are the types of programs that allow you to see the very best resources and commitment from your supply base, so why wouldn’t you want to reward them for that type of commitment? The key is to determine what the specific outcome means to you, ensure that the benefits are directly attributable to your suppliers’ efforts and time bound the benefits as you may go through other changes that obviate the changes made by the supplier. If there are some shared investments, you will often see both parties recouping their investments prior to some sort of gain sharing arrangement. Always keep in mind that some of these projects may benefit the supplier in their interactions with other customers, so don’t give up the farm, especially when you are putting in some of the intellectual capital. Look at what is happening to profitability and growth in the suppliers’ industry. You can do that by looking at analysts’ reports and the companies’ financial statements. Knowing a company and industry’s financial health, can give you an idea of how aggressive they will be in bidding for your business. Last but not least, make sure that as you put together your annual sourcing strategies, that you partner with your clients to get ownership and buy in. Sourcing is not something you should be doing “to” your internal stakeholders, but activities with your stakeholders to assist them in achieving their goals and objectives. Gaining that buy in and partnership will take some effort but will pay great dividends in the end.